Valve is handing out free games after a software glitch locked thousands out of their Steam accounts. Thousands of Modern Warfare 2 players found their Steam accounts banned over the weekend, despite no wrongdoing on their part, thanks to an error made by Valve's anti-cheat software. 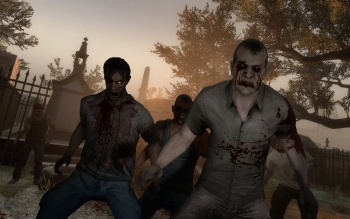 Valve has now rectified that error, and has given away free copies of Left 4 Dead 2 as an apology. Anyone who was mistakenly banned received an email from Valve president Gabe Newell, which explained that the bans were due to Modern Warfare 2 failing a signature check after Steam updated the game. He added that it wasn't a game specific issue, and apologized to the 12,000 people affected for any "frustration or angst" the bans might have caused. Valve has given each affected player a copy of Left 4 Dead 2 to give to a friend, as well as a copy for themselves if they didn't already own it. It's not hard to see why Valve has such a good reputation amongst gamers, as there aren't many companies that would give out two copies of a game to apologise for a mistake. You also have to admire the way Valve has taken what was potentially a PR nightmare and completely turned it around.